V9-Tahoe Retreat - large lot, spacious living area, back deck with hot tub! Close to hiking/biking trails. 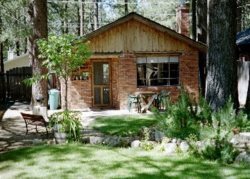 Spacious Tahoe Retreat in Tahoe Paradise on more than 1/2 acre of forested land! Approximately 6 miles to the casinos, lake and Heavenly Ski Resort. 5 bedroom, 3.5 bath sleeps up to 12. Large fully equipped kitchen with everything you need to prepare a large family meal. Cable TV, DVD, VCR and Stereo. High speed internet access. Gas fireplace on a thermostat. Linens provided, washer/dryer. Gas BBQ on back deck with private hot tub (seats 7)! Nice large corner lot with privacy, long driveway to accommodate 3 cars (no parking on the street in winter months). No pets and no smoking.